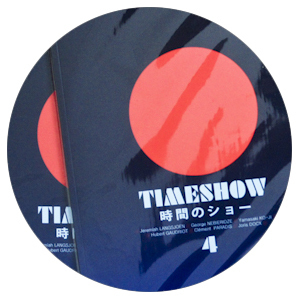 The first issue of Timeshow was published in spring 2011. What is Timeshow? Good question. Timeshow is place where photographers can tell their stories and find new ways to express what they see and what they do. So yes, Timeshow is some kind of "zine" as we say today. It isn't periodical, it has no definitive form: it just adapts to what the photographers propose. In each issue, Timeshow gives space to six to ten photographers. Timeshow is not a magazine about photography, it is a photography zine: that's why the universal language of photography is most often used in our pages. But it's also important to hear the photographer's voice, so all the series are accompanied by a handwritten letter of the photographer, explaining his or her work, life, or whatever important thing the reader needs to know. So yes, we believe photographers have things to say, and since we also want people to hear them, Timeshow is non-profit: we try to make it as cheap as possible, and utlimately, each issue is released for free on the web. To tell you a bit more about the history of Timeshow: the first three issues were periodical, they were released every three months for free on the web-that was the challenge of this trilogy. The layout of those first three issues was inspired by the legendary underground gay magazine MAGAZINE published by Didier Lestrade and Mistgris from 1981 to 1987. MAGAZINE was an example, not only in the artistic direction and the design (they were among the first to publish the photos of Pierre & Gilles...) but also in the determination of those who were doing it. While Timeshow is not a gay magazine, it is clear that this culture still inspires creators worldwide. This layout was a tribute to people who never stopped fighting for what they believed in. We hope we'll continue to walk on their tracks!